Engaging the Japanese in the Battle of the Coral Sea, search planes from Lexington located the Japanese carrier striking force-including Zuikaku and Shokaku, the flattops that had proved so elusive the day before. ... Yorktown planes scored two bomb hits on Shokaku, damaging her flight deck and preventing her from launching aircraft; in addition, the bombs set off explosions in gasoline storage tanks and destroyed an engine repair workshop. Lexingtonâ€™s Dauntlesses added another hit. While US planes were attacking the Japanese carriers, Yorktown and Lexington alerted by intelligence that the Japanese knew of their whereabouts, prepared for a retaliatory strike. ... Shortly after 1100, the attack commenced. US Wildcats slashed into the Japanese formations, downing 17 planes however some managed to slip through US defenses and the Kates that did so managed to launch torpedoes from both sides of Lexington's bows. Two fish, tore into Lexington; dive bombers Vals added to the destruction with three bomb hits. ... Yorktown was having problems of her own. 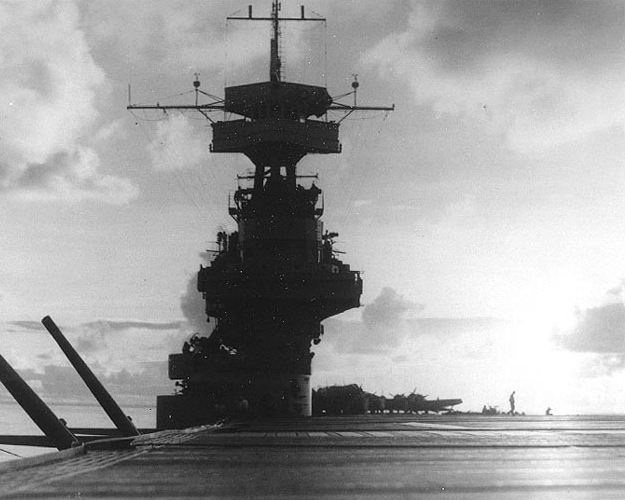 Skillfully maneuvering the ship, the carrier evaded eight torpedoes. Attacked then by Vals, the ship managed to avoid all but one bomb. ... That one, however, penetrated the flight deck and exploded below decks, killing or seriously injuring 66 men. ... Yorktown's damage control parties brought the fires under control, and, despite her wounds, the ship was able to continue flight operations. The air battle itself ended shortly before noon on the 8th. Yorktown had suffered enough damage to cause experts to estimate that at least three months in a yard would be required to put her back in fighting trim. ... Unfortunately, there was little time for repairs, because Allied intelligence had gained information from decoded Japanese messages that the Japanese were preparing a major operation aimed at Midway.